Time: 8:00pm. Admission: by donation. Age restrictions: No Minors. Address: 941 Willoughby Ave.. It’s Bushwick Book Club time. The book if Negin Farsad’s HOW TO MAKE WHITE PEOPLE LAUGH. She’ll be there to speak about the book and do some stand up. We’ll have songs inspired by the book! Dance inspired by the book! Snacks inspired by the book! Improv inspired by the book! Time: 7:00pm. Age restrictions: No Minors. Address: 376 9th St.. Venue phone: (347) 422-0248. Presenting new songs, dance and hors d’oeuvres inspired by Kurt Vonnegut’s A MAN WITHOUT A COUNTRY. Performances by JOHN S. HALL, TERRY RADIGAN, DON RAUF, SWEET SOUBRETTE, SUSAN HWANG, CHARLIE NIELAND, JESSIE KILGUSS, CASEY HOLFORD, RAY BROWN, THOMAS WOLFE, SWAN DRSTI. Songwriting nerdery at its best. Happy 2017. Time: 7:00pm. Age restrictions: No Minors. Address: 300 Observer Highway. Venue phone: (917) 922-2690. This is our end of year celebration featuring songs about books we’ve created in 2016. Come and help celebrate another great year of creativity inspired by creativity. Time: 7:00pm. Age restrictions: No Minors. Address: 1331 SW Washington Street. Venue phone: (503) 223-0054. Bushwick Book Club presents new music inspired by ZINESTER’S GUIDE TO PORTLAND as an official LIT CRAWL Portland event kicking off the WORDSTOCK weekend! There will be new Zinester-inspired songs from Portland talents, RALPH CARNEY (Tom Waits, B-52s, Black Keys), MIKE DANNER, AMY FAUST (Mike & Amy in the Morning on 99.5 The Wolf, The Bushmills and The Mortifiers) JANET JULIAN, along with BBC Seattle contributor, DON RAUF (Life In A Blender). Bushwick Book Club founder, SUSAN HWANG will be there to host and perform with BBC New York contributor, CHARLIE NIELAND as their new lit-based duo, LUSTERLIT. It’s songs about books! Book-inspired times coming at you from all directions. Surrender. This is an official Portland LitCrawl event to kick off Wordstock Portland! Time: 8:00pm. Admission: donation. Age restrictions: No Minors. Address: 274 Varet St. (back of Ange Noir Cafe). Venue phone: 718 821 2459. I’m hosting and playing a song for Bushwick Book Club presents MONSTERS OF LITERATURE! WE have 9 other talented, brilliant and funny local songwriters and musicians performing their new songs. Any monster in a book is fair game. Ukrainian animator, Sashko Danylenko will be screening his animated piece inspired by a monster of Ukrainian folklore! It’s a book-inspired Halloween appetizer. Time: 8:00pm. Age restrictions: No Minors. Box office: (212) 539-8500. Address: 425 Lafayette St.. Singing harmonies for Jim Andralis’ beautiful songs. So looking forward to this. Time: 6:00pm. Age restrictions: No Minors. Address: 2 Lincoln Square. Lusterlit plays a set at the American Folk Art Museum! Time: 8:00pm. Admission: 7-10. Age restrictions: No Minors. Box office: (347) 987-3971. Address: 1031 Grand St.. Venue phone: (347) 987-3971. Look, no one’s going to be turned down at the door. Whether you want to pay $1 or nothing or $30… It’s a sliding scale. The night isn’t called Easy Math for nothing. Basically, any math works. True Dreams, Automaatio, Lusterlit and Cat Tatt play… come and have a time with us. Time: 8:00pm. Age restrictions: No Minors. Address: 1123 8th Avenue. Venue phone: 718-965-9526. Playing Terry Radigan’s songwriters series, THE RADIGAN ROUNDUP. She always curates a great night of interesting songwriters and musicians. We’re excited to be a part of this intersection of thoughtful music and songwriting. Related post. Time: 8:00pm. Age restrictions: No Minors. Address: 94 Ave. A. Venue phone: 212) 473-7373. Playing a night curated by NAN TURNER! She’s on her Nan-cation, one of the most festive parts of the season. LUSTERLIT plays a set and also, I join Nan as one of her ONE NIGHT STANDS!!! ALSO, I’m playing in John S. Hall’s new band, SENSATION PLAY. Get down. Get merry. Time: 7:00pm. Age restrictions: No Minors. Address: 300 Observer Highway. Venue phone: (917) 922-2690. Opening for Jim Andralis on the last night of his Monday night residency at this incredible, magical art space featuring the art of Issa Sow. Time: 8:00pm. Age restrictions: No Minors. Address: 829 East 3rd St.. Lusterlit screams for ice cream. And for books about ice cream. Time: 7:30pm. Box office: (212) 420-8392. Address: 196 Ave. A. Venue phone: (212) 420-8392. It’s the Lusterlit (me and Charlie Nieland) and Jessie Kilguss release show! We’re releasing our recordings of songs written for BUSHWICK BOOK CLUB! Special guest performances by Sweet Soubrette, Casey Holdford, Pearl Rhein and John S. Hall! We’re playing songs about books. For about 3 hours. Related post. Can I just tell you that this night is happening, and it’s incredible. It hasn’t even happened yet, and it’s incredible. Leslie Graves is playing her set first at 7pm. 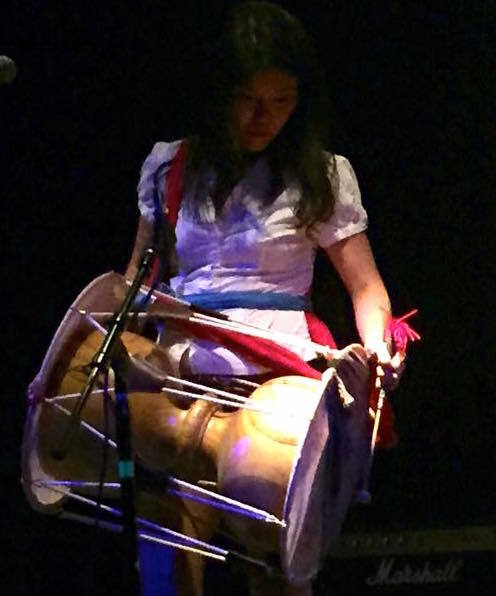 I’m backing her up on my Korean drum (Jang-gu) and vocals. And Julie Delano too (vocals, bass). Then, I’m playing a Relastics set with Leslie and Julie on vocals and dance moves, along with MARLON CHERRY and NAN TURNER guest drumming. Come on. THEN, GOLD plays and shines in all her punk/rock/girl-band glory. That’s Julie Delano’s incredible songwriting and bass playing with me and Leslie on harmonies and Christy Davis on drums. There you go… that’s all I can say. Things will happen. Much of it will not be in our control. It’s funner that way.